1) FPL which is a power-limited fire alarm riser cable is usually the least expensive because it is the most basic type of fire alarm cable and is also recognized by the NEC (National Electric Code). FPLR cables are suitable for use in a vertical run through a shaft or from floor to floor within a building. 2) FPLR Shielded is a power-limited fire alarm shielded cable, has the same components of the standard FPLR but, includes an aluminum polyester foil shield and drain wire to protect against outside interference. 3) FPLP which is a power limited plenum cable and they are recognized by the NEC for use in air ducts and plenum spaces and any other space that is used for the flow of environmental air. These cables tend to be a little bit more expensive due to the additional engineering and protection they offer. All FPLP cables are listed as having adequate fire-resistant and low-smoke-producing characteristics as well. 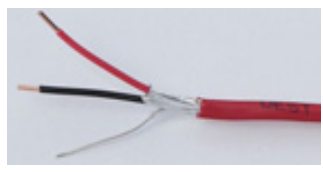 4) FPLP Shielded cables are power limited plenum fire alarm cables with an aluminum polyester foil shield and drain wire to block an additional interference within a cable. 1) NPLF or, non-power limited fire alarm cables are recognized by the NEC and are suitable for all general fire alarm cable uses. They cannot, however, be used in riser, ducts or plenum spaces that used for environmental air flow unless they are properly installed within a conduit. 2) NPLFP are non-power limited fire alarm cables are also recognized by the NEC but these cables are suitable for installation in ducts, plenums and other spaces where environmental air flows.